I have been sitting on my hands waiting to share the gorgeous new Tilda range, Lemon Tree, with you all. Originally scheduled to come out early this year the release date was delayed until last week. It has certainly been worth the wait. The lovely folks at Sew and So sent me a few prints from the new range to play with. There is a wonderful palette of fresh vibrant colours that really have me excited. I love that these play well with designs from Tilda's previous ranges but have such a fresh bright look. I knew that I wanted to use the small scale prints to create some patchwork and the larger feature print with some quilting to really show off the design. I created my new Take it All Tote. A capacious and sturdy tote that uses the excellent Vlieseline Stylevil to create a self supporting Tote bag that can easily be loaded with whatever you need, whether it be supplies for a craft class or a picnic or towels and snacks for a day out at the beach. I had great fun piecing the patchwork panel for the front of the bag, the ditsy print I used for the binding is my favourite and the simple natural linen from Stoff really sets of the bright colours of the Lemon Tree. I used a simple striped cotton lining and thick padded handles for comfort during use. The back of the bag shows of the wonderful print Lemon Tree in Plum, quilted simply with a flower motif to let the fabric do all the talking. There are so many wonderful details to pick out in this fabric, camels, elephants, ballerinas and penny farthings, it is so fun! I will be teaching the Take it All Tote at Serendipity Patchwork and Quilting in Bovey Tracey over two mornings on March 8th & April 26th and the cost is just £35 for the two sessions. You can contact them to book a space through the website. It promises to be a great class with instruction on how to piece the patchwork, how to work with innovative stabilisers for great finished results and of course the chance to sew with beautiful fabric! You can find the full range of the new Tilda Lemon Tree at Sew and So and for Vlieseline Stylevil Stabiliser please visit Lady Sew and Sew or Six Penny Memories. It’s the end of an era. The last ever issue of Sewing World magazine is in stores now and I have two projects in this closing issue. You can find out where to get your copy locally here, or buy online here. I have my wool and leather bucket bag, the perfect bag to make to compliment any outfit. Simple yet stylish. And a fun clamshell cushion made with the gorgeous Liberty Quilting Cottons. I am really touched to have been included in the reflective feature looking back on the 265 issues it ran for. Being a regular contributor was an honour and they really were the most wonderful people to work with. Many of you may not know that Gutermann, a world leading Thread manufacturing company also produce a great range of high quality cotton fabrics in a range of collections. The Portofino Collection is a fresh palette of prints perfect for spring projects, inspired by the Mediterranean. Colours include powder blue, chalky pink, sandy beige and elegant grey. Designs including feathers, hydrangeas and roses mix with geometrics on pure cotton fabric making this perfect for sewing and crafting. The fabric is extra wide compared to your standard quilting cotton (145cm) and the base used is so soft and has a lovely hand. I tend to hesitate at using quilting cottons for dressmaking these days, finding that it is not as supple or soft to wear as other substrates, but it is hard to resist the wide variety of wonderful prints. Gutermann Creativ have completely allayed this for me, this cotton fabric is so beautifully soft to wear, I didn't hesitate to whip up some new lounge trousers for my girls in the wonderful feather print. As the fabric is extra wide it is so economical to use. These are simple elasticated PJ bottom/lounge trousers with a one piece leg so that extra fabric width really helps to cut out these big pattern pieces with minimal waste. As always for dressmaking I pre-washed the fabric, overlocking the cut edge before doing so, I find the time taken to do the overlocking is saved on untangling and neatening the inevitable frayed edge if you skip this step. The girls absolutely love their trousers, I am genuinely surprised at how soft the cotton has come up, after just one wash they feel like long lived in and loved cosy pyjama bottoms. There is no colour fade too, which is great! I choose the blue feather print for my tomboy girls, but I would love a pair for myself in the hydrangea print. I plan to use the offcuts from the trousers to line the pockets on my next pair of jeans, it will make them beautifully soft and cosy and being cotton it has the stability I need. I also wouldn't hesitate to use this for quilt backs, its extra width makes it a winner here too. The fabric used here was supplied by Gutermann Creativ and you can find details of your nearest stockist by contacting gutermann@stockistenquiries.co.uk and you can also visit their Facbook page here for more ideas and inspiration. If you are interested in making similar trousers I can recommend the Moon Pant pattern for children and the Luna Pant pattern for women from Made By Rae. Sewing World January 2018 - Make a cosy new quilt for the new year! The latest issue of Sewing World magazine is out and on sale now. There a heaps of great patterns and projects to get you inspired for some new year sewing along with the start of their Capsule Wardrobe collection which is brilliant! My offering this month is a sumptuously cosy Tilda Harvest rag quilt. 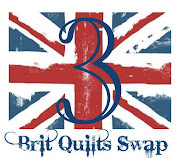 Perfect if you need a quick fix of snuggly and warm for the early months of the year and it really is an easy quilt to make if you are new to quilt making. The instructions in the magazine will take you through it step by step. Available in all good retailers (find your copy by searching here) or you can order single copies on line here. Find Sewing World on Facebook, Twitter and Instagram. 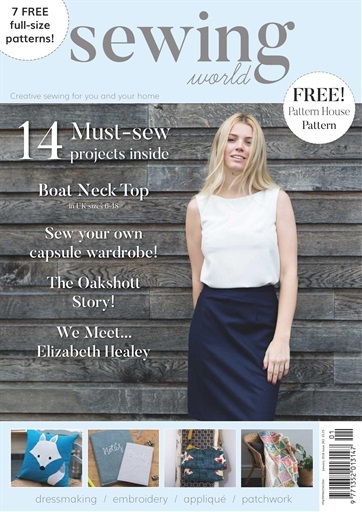 The latest issue of Sewing World magazine is out in shops now. Packed full of beautiful projects it is a must buy! There are lots of sweet quick makes that would be perfect for Christmas gift ideas. I also have a project in this months issue (thats the 9th time this year I have been featured in Sewing World, yay!). I really hope you like it, its one of my most favourite to date! I used the stunning traditional Hungarian Kalocsa style of embroidery to design my free machine embroidered purse. But I have one copy (complete with the free cover pattern) to give away to a reader. Simply comment below to be in with a chance and I will draw a winner on 23 November using a random generator, please be sure you are not a no-reply commenter. For an extra chance to win head over to my Instagram and comment there on my giveaway post too. Sometimes being creative can be a drain. The constant demand for new ideas can actually block the flow of inspiration and the deadlines and work that come with creating new patterns for publishing can mean there is little time left to actually play, think or dream of new projects. So you just have to hit pause. Which is exactly what I have been doing for a couple of weeks. Don't get me wrong, there has been no rest! But rather a little respite from the deadlines and compulsory sewing and writing. It has given me the chance to play a little and in doing so I have found new ideas for work. How lucky can one be when the research and development of new projects actually can be playing with fabric and having fun?! One idea I have been wanting to try for a long time is some machine appliqué clamshells. One evening a stack of the new Tilda Cottage Collection was calling to me, I was in a festive mood and it has some perfect christmasy coloured prints. I used my tried and tested technique for turning under the raw edges of the clams and then machine appliquéd them to a linen base. You will have to excuse the poor finishing of the clams, this was certainly a case of the head working faster than my hands! I was in such a hurry to get the idea out of my head and tested that this was only ever intended as a practice piece. Of course, I couldn't resist finishing the piece and turning it into something useful! I just made up enough clams to cover the base of my scrap of linen and I let this this determine the size of the pouch. A quick bit of hand embroidery, add some lining, wadding and a zip and I have a zippy pouch. For the hand embroidery I printed out the wording I wanted using my computer and traced it on using my lightbox and a Frixion marker as I never trust my poor handwriting to do it freehand. I always print a few different sizes on the sheet so that I can choose the one that has the best fit when I hold it up to the project rather than having to go back and forth trying different ones. I squared up and trimmed the embroidered outer and then cut the linen backing, lining and wadding pieces all to the same size. The linen outer allows the pretty Tilda prints to do all the talking, I really love how these prints can be so festive but without a hint of christmas images in them. For the lining I used a salvaged piece of stripe shirting. I love how its simplicity is the perfect match for the outer. I used Vlieseline 279 cotton mix wadding which gives the pouch a little structure but a lovely soft handle. I do hope in the run up to Christmas there will be more time for me to play but for now I must get my head down and meat my end of year deadlines! I hope you all get the chance to work on some pretty and frivolous projects too, all work and no play is good for no one! Stockist enquiries for the Tilda fabric which was supplied by Groves Ltd can be made by contacting groves@stockistenquiries.co.uk where they will be happy to assist you. 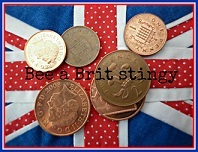 The wide range of Vlieseline products can be found at Lady Sew and Sew and Six Penny Memories. I have to hold my hands up right now and confess, 95% of the decorating I do at Christmas is for me, not my children, not my visitors, but me. I love to create a winter wonderland and my discovery of the Tilda Dolls last year took this magic to a whole new level. Last year I made a beautiful Tilda Santa complete with traditional red velvet coat and white fur trimming. He was a joy to make, but he seemed a bit lonely. So earlier this year I made a wonderful fur polar bear from the book Tildas Winter Delights, there are several sizes and I have already had demands for a tiny one from my girls. Then I found out that alongside the new Cottage Collection Tilda were releasing a Patchwork Santa Kit. I couldn't resist, Patchwork AND Christmas all in one Santa? Yes please! The kit comes with everything you need to make the Santa (except wadding and Stuffing, more on that in a minute). It has complete illustrated step by step instructions that cover the construction of the doll and the patchwork coat. You are of course free to make you own tweaks to the design and the kit comes with a generous amount of fabric so that you can add any extra accessories you may wish - miniature patchwork santa sack anyone?! I found the doll pretty easy to make over a couple of days. There are a few fiddly tasks, like turning and stuffing the thin legs and arms, here I found the wooden stick provided in the kit very helpful. I also found holding the legs and arms in place whilst trying to sew them to the body a little awkward, but my Clover appliqué pins were very useful. Their tiny size means you can put a few in that you just wouldn't have room for with normal pins. I also found Gutermann Hand Quilting thread great for attaching the limbs, it has the extra strength you need to be able to put quite a lot of tension on the thread without breaking and attaches the limbs securely. My previous Tilda doll had taught me that standard wadding like the kind I use in my quilts just won't work for the doll clothing. Despite being low loft quilters wadding it was just too dense and thick for the tiny seams and particularly the underarm area, causing puckering no matter how much clipping of the seam I did. This time I tried Vlieseline's Thin Fleece 248 which is an incredibly lightweight and low volume batting. It was the perfect match! I am so glad I found this and I will certainly be using it for all my future Tilda Dolls, alongside the Deco-Wadding also from Vlieseline which is my absolute favourite doll stuffing. It is so fine you don't get the lumpiness you sometimes run the risk of with cheap poly stuffing. Because the kit came with such a generous amount of fabric I was lucky enough with some savvy cutting to have quite a bit left. I couldn't resist using the leftover 'doll skin' fabric to make a couple of cute reindeer. I used the free pattern on the Tildas World Blog for the Tiny Egg Hares and just added some little stick antlers. There is a pattern for large reindeer in the book Homemade and Happy but I think these tiny ones are adorable and will look wonderful tucked away around the house at Christmas. I didn't make many changes to the original design of the Patchwork Santa, I just added a little bell on the end of his hat and some little bows on his socks/boots. The Kit and fabrics used were supplied by Groves Ltd and stockist enquiries can be made by contacting them at groves@stockistenquiries.co.uk where they will be happy to assist you. The wide range of Vlieseline products can be found at Lady Sew and Sew.